I love telling stories for the greater good. For the last five years I have worked in the fundraising sector, crafting copy to save koala forests, buy hospital equipment for sick kids and bring safe water to disadvantaged communities. I'm so grateful to have found this niche where when I can use my writing skills to make a difference. I've also spun words and ideas for many other sectors, including tourism, health and finance. I write with clarity, impact and authenticity, whether you want a seductive travel piece or hard-hitting digital activism. I'm a word nerd, who won’t rest until I’ve nailed just the right style and rhythm for your brand, message and medium. I wrote the text and description for this video, which tells the story of how Act for Peace's early education programs are helping to build a more just society in Pakistan. 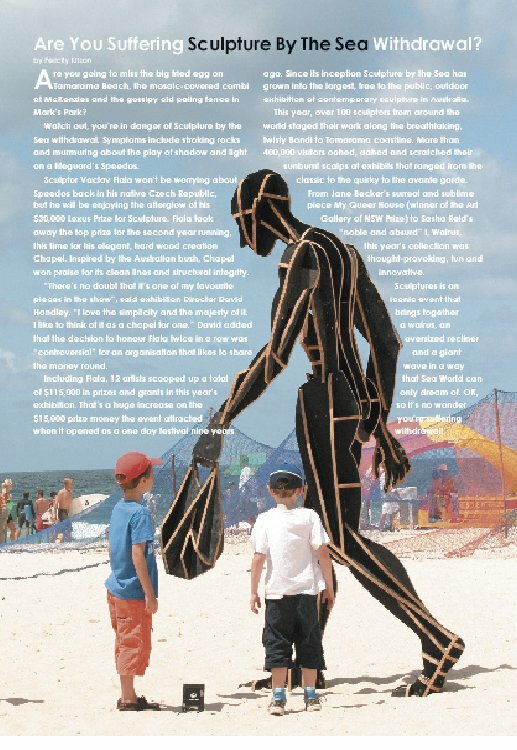 The 40th anniversary issue of WWF Australia's supporter newsletter 'Living Planet'. Soi Dog's 'I Didn't Know' campaign raised more than $1.5 million in regular giving revenue online, prompted a global outcry against the South East Asian dog meat trade, and led to Thailand's first-ever animal welfare law. This was one of the IMC's highest performing acquisition appeals. As the digital writer for Tourism Australia, I spend several years writing about Australia's amazing destinations and experiences. 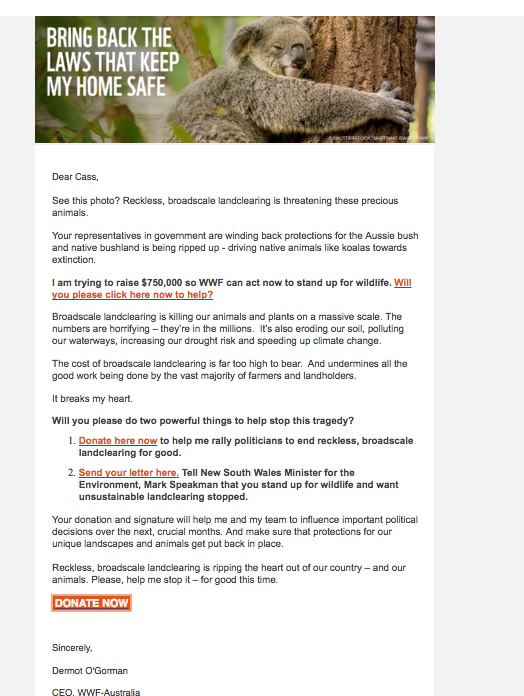 Part of a WWF Australia campaign to stop the rampant landclearing that's driving koalas and many more of our unique native animals into extinction. I wrote all the social media for this incredibly successful campaign for Action for Dolphins. Its aim was to make the World Association of Zoos and Aquariums (WAZA) stop endorsing aquariums involved in the bloody Taiji dolphin hunts. On top of more than 80,000 petition signatures and 40,000 new email subscribers, the campaign won massive engagement on social media and led to WAZA suspending members who were buying Taiji dolphins. I worked extensively with Cochlear to tell the emotional, human story of their high-tech hearing devices on several websites. I was the lifestyle and fashion writer for 'The Beast' - a monthly magazine for Sydney's eastern beaches. 'We've done our loanwork' - a call to Australians looking for a mortgage broker they can trust. 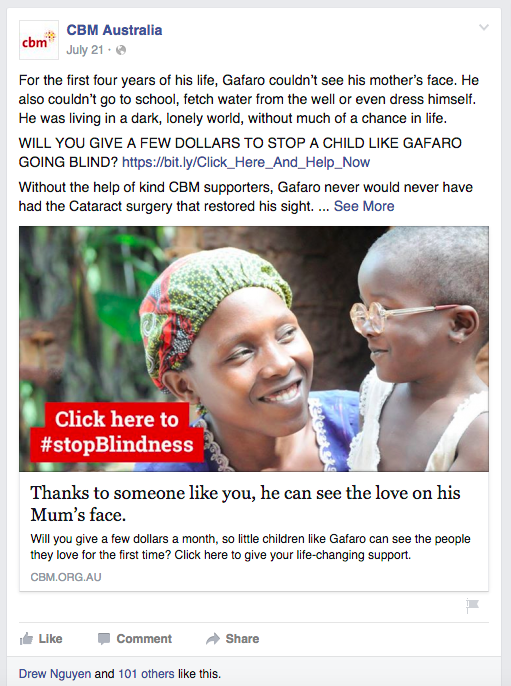 Social media to #stopBlindness - this one about little Gafaro and his new life with sight. A piece on Sydney's small bar scene for well-heeled global travellers. 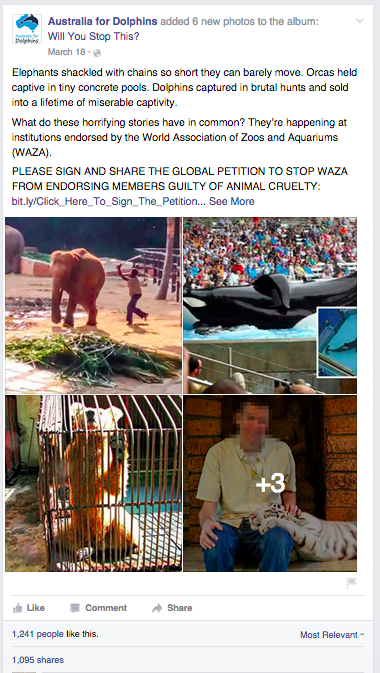 One of many FB posts driving people to sign the global petition against WAZA - it inspired more than 1,000 likes and shares. I love writing in a doggy's voice. More fashion for Bondi hipsters.